Precious metals ended lower Friday, resulting in a bit bigger weekly losses for gold and silver and trimming gains on the week for platinum and palladium. Gold’s close was its weakest in more than a year. Gold for August delivery on Friday declined $2.70, or 0.2%, to settle at $1,223 an ounce on the Comex division of the New York Mercantile Exchange. The settlement is the lowest since July 13, 2017, when prices ended at $1,217.30 an ounce. 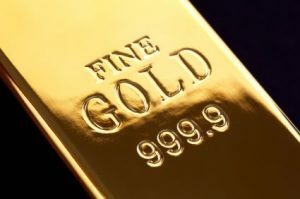 "Though we would argue that markets have relatively priced in on greenback vigour and current-term economic data, the precious metal looks poised to erode further as geopolitical uncertainties from the EU and U.S. rescind gently," Benjamin Lu, a commodities analyst at Singapore-based broker Phillip Futures, said in a note quoted by Reuters. Gold futures registered their third straight weekly decline with losses of 0.7% this week, 0.8% last week, and 1.2% in the week before then. The yellow metal has fallen in six of the last seven weeks and it is now 6.6% lower on the year to date. "Seventeen market professionals took part in the Wall Street survey. Seven respondents, or 41%, called for higher prices, while six, or 35%, said lower. Four respondents, or 25%, predicted a sideways market. Meanwhile, 617 voters responded in an online Main Street survey. A total of 261 respondents, or 42%, predicted that gold prices will be lower in a week. Another 252 voters, or 41%, said gold will rise, while 104, or 17%, see a sideways market." Silver for September dipped less than a half cent to close at $15.493 an ounce. Silver futures shed 0.4% this week, plunging a combined 7.5 % in their seven consecutive weekly losses. The metal is 9.6% lower on the year so far. October platinum fell $4, or 0.5%, to $831.70 an ounce, but edged up 0.3% on the week. Palladium for September delivery dropped $15.10, or 1.6%, to $918.50 an ounce, but scored a 3.3% weekly increase. The pair remains lower on the year to date with losses of 11.4% for platinum and 13.4% for palladium. Gold declined $4.30, or 0.4%, to 1,223.95 an ounce. Silver fell 18 cents, or 1.2%, to $15.355 an ounce. Platinum declined $6, or 0.7%, to $829 an ounce. Palladium lost $1, or 0.1%, to $930 an ounce. In LBMA results for the week, prices for platinum and palladium respectively rose 0.6% and 4.3% while those for gold and silver declined 0.4% and 0.1%. Gold bullion coins rose by 7,500 ounces this week after they advanced by 20,500 ounces last week. American Gold Eagles accounted for all the gains this week. Last week, splits included 13,000 ounces in American Gold Eagles and 7,500 ounces in American Gold Buffalos. Silver bullion coins moved up by 240,000 this week after rising by 180,000 last week. For a fourth week in a row sales came entirely from American Silver Eagles.